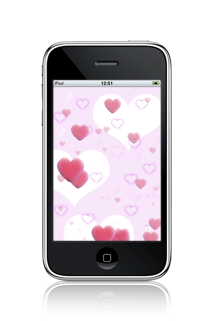 My iPhone: Is This Love? Things get old. Whether it’s your family’s beloved cat or dad’s first Chevrolet, possessions that we loved and cherished at one point eventually degenerate into a pattern of uselessness. Sadly, this just began to affect me as I have slowly and painfully watched the deterioration of my iPhone 3G. I feel it’s like watching a grandparent go, one by one, parts slowly becoming less useful, and everything a little slower and less functional. Starting with the internet not moving as fast as it once did, my grandmother seems to be following a similar trend. The sleeper button doesn’t work anymore, and the silent button always fails in the simple task of muting my phone. Nevertheless, I still love it no matter the age, the wrinkles, and even the scratches I take responsibility for. Although busted up and battered, my phone rarely says no to a challenge. Say I get lost and need directions, the iPhone comes through. With turn by turn directions from the current location to my destination, my phone is my guide, and yes, my friend. Taking the Metro through South Central, it had me covered when my music mood was feeling some NWA. It’s important to have limits as social networking can be very addicting. It’s important to distinguish the difference between convenience and a relationship. This is why it’s important to have some ground rules. If used in the right way, a smartphone is pretty nifty. It’s more than a phone: it’s a way of life. In all honesty, I can’t imagine a day without it. To those who haven’t had the experience of using one, you wouldn’t understand my feelings. For those who do, I’m sure this provides some gratification that there is someone else who feels the same. Although mine may be old and feeble it still comes through like a friend and, who knows? This could be love.